‘You can’t manage that’, was the waiter’s comment on my order at City Top, a restaurant in Mbarara. I just ordered Kalo, which according to the waiter was a millet paste. I thought it was worth trying. He insisted: ‘that is not food for white people. Not even for me. That is for people in the villages. They can handle it. We can’t, it’s bad for your stomach’. I ordered anyway, just to try. Kalo is actually a mixture of boiled millet flour and a bit of cassava flour (also known as manioc or yucca). Kalo looks like an enormous piece of crap and its texture is both sticky and soft. The taste is rather neutral so people eat it with some sort of sauce. You don’t use a fork to eat kalo. Instead, you pull of a small piece with your hands, mold it with your thumb to make a hole, and then dip it into the sauce. The waiter was right. Kalo is extremely heavy and I doubt I can handle an entire piece of it. 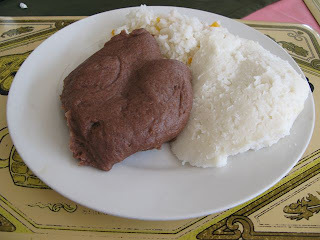 Another Ugandan delicacy is Posho, maize meal. As far as I could find out, posho is mostly made of maize flour although some people mix cassava. A couple of people told me that posho is made of cassava but I find it very hard to be true since cassava has a chewy and sticky texture and Posho is hard. Posho looks white, which is funny since both maize and cassava usually have a yellowish tone. I tried to find out why but people just say it’s the normal color so I assume it’s something to do with local maize. Just like Kalo, posho has little taste and people eat it with sauce. 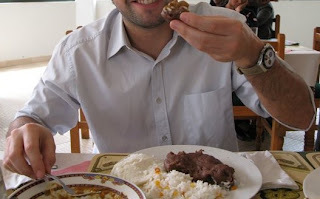 I also learned this week that biñeuá is also called gnut sauce (pronounced g-nut) and is actually made of peanuts and a sort of aubergine. Anyways, it’s still awesome and the best sauce to eat with either matóke, posho or kalo. 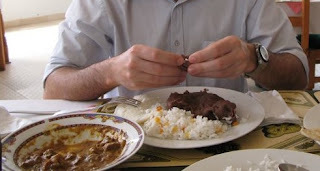 Kalo, posho, matooke and rice are the staple foods in Uganda because they’re cheap, very energetic and rich in fibers.